In order to provide the peace of mind of knowing you’re doing business with a reputable company, it’s important that your cash advance provider is a Community Financial Services of America (CFSA) member. CFSA members, like Amscot, practice responsible lending by adhering to industry best practices and provide strong consumer protections. CFSA members are required to prominently display the CFSA Member Seal and Industry Best Practices in all store locations. 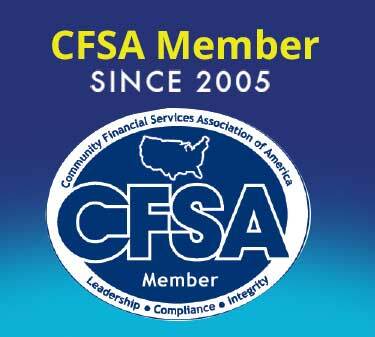 They also must provide new customers with the CFSA Best Practices Brochure. Amscot has been a CFSA member in good standing since 2005. Ian MacKechnie, Founder and CEO of Amscot Financial, serves on the CFSA Board of Directors.